This is a quick overview of the program. It allows you to start using SSL Enforcer within few minutes. For more detailed information please see documentation. 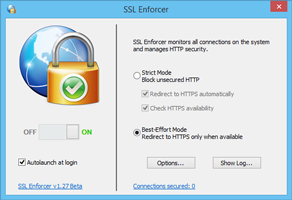 Download and install SSL Enforcer. You can uninstall SSL Enforcer at any moment with Start‑>SSL Enforcer‑>Uninstall SSL Enforcer program or through Windows Control Panel. On Mac, simply move SSL Enforcer app to Trash. When you start SSL Enforcer, it runs at the background and adds its icon to the system tray on Windows or menu bar on Mac. Click this icon to open the window with the main settings. By default, SSL Enforcer works in Best-Effort Mode. It provides the best possible security whenever is possible. The connection is put on hold. There is no data leak over unsecured channel! SSL Enforcer checks for HTTPS alternative for the given web site and URL. If HTTPS is available, the original connection will be transparently redirected. SSL Enforcer also monitors for generic (non-HTTP) traffic and checks SSL/TLS version and cipher suites. Depending on the settings, it can block unsecure outdated protocols. You can change this behavior with Settings and Options. 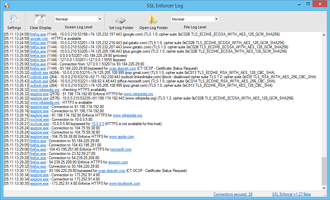 To get more info about the SSL Enforcer activity, you can examine Log window. Several verbosity levels are available. While the default settings are OK for many users, you can easily configure SSL Enforcer for specific scenarios. In the main settings you can switch between Best-Effort and Strict modes. If you disable HTTPS availability check, SSL Enforcer will redirect everything to HTTPS instantly. This will speed-up the processing. 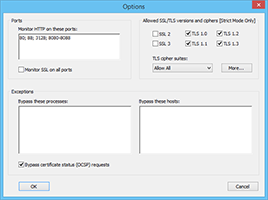 In the Options, you can configure advanced parameters like HTTP ports, Exceptions and SSL/TLS options. Ports section allows you to force SSL security for non-standard ports. 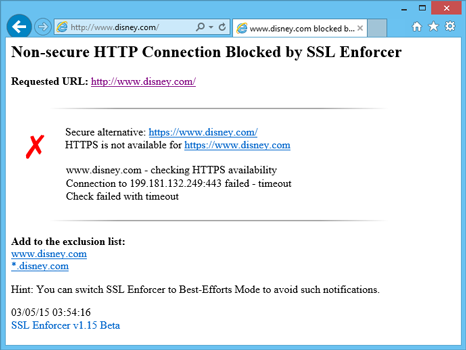 Exceptions will tell SSL Enforcer to skip selected hosts and processes. You can also control allowed SSL/TLS versions and ciphers.